I'm a fanfictional writer. I only just recently found out about this site. I also am a photographer and fictional writer; though I have yet to finish my Children's Book that I'm writing. I'm unemployed, I'm a woman, I'm single and I'm 20-30 years old. I'm a fanfictional writer from fanfiction.net. I only just recently found out about this site. War of the Clans - Sequel to Am I Going Crazy? Now as husband and wife; Sesshomaru and Kagome make their journey to become mates. Once bound they will have challenges thrown their way; however the biggest challenge either will face will be keeping the two most powerful Inu clan united as Kagome makes plans to ensure that youkai make it to the Modern Era. However, with possible war on the horizon how can one Miko and a proud Daiyoukai accomplish the impossible? Heat - Spring has come and with it the Inu heat. Inuyasha has never thought Kagome looked so good, but he's not the only one. A certain Daiyoukai suddenly finds the Miko of the hanyou more interesting than ever. What's a girl to do with all this attention? - COMPLETED!!!! A Miko's New Years Eve; A Daiyoukai's Dilemma - Semi-Sequel to The Twelve Days of Christmas. Now in the future and having celebrated many years together Sesshomaru and Kagome always keep it interesting between one another. (For Kaoruhana's New Years 2015-2016 Challenge.) - COMPLETED!!!! The Twelve Days of Christmas - I'm doing a Banner Challenge. This is a series of one-shots that are all interconnected. - COMPLETED!!!! The Mistake - Somebody has forgotten their mates anniversary; now it's time to pay the penalty for such a grievous mistake. 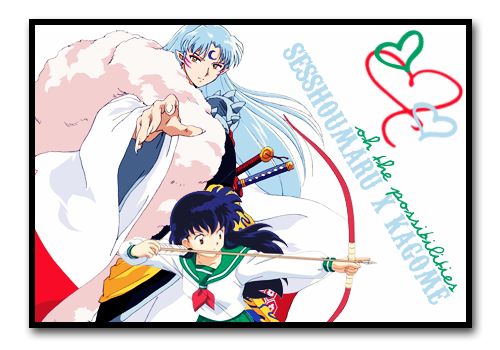 (For MoxyMikki's Make Sesshomaru Submit Banner Challenge.) - COMPLETED!!!! Am I Going Crazy? - Things are occurring to the gang. People are appearing to look different and everybody is beginning to think they are going crazy, but are they? Or. Is somebody doing this to them? (For sugar0o's Inuyasha Genderbender Challenge.) - COMPLETED!!!! A Miko's Peace - (is my first Sesshomaru/Kagome story) Peace seems to be reigning in the feudal era or is it? Kagome wishes for peace between humans and youkai. She wants to find a way to ensure youkai and humans can live together in peace so her friends can one day be with her in the future, but with every step she takes it feels like she takes steps backwards. She needs help not just from Inuyasha, but perhaps even from Daiyoukai Lord Sesshomaru, but as she gets closer to the Daiyokai the further she feels she's getting from Inuyasha. How can she bring peace between two species if she can't bring peace between the two brothers? She's going to need help... - COMPLETED!!!! Alone, But Not - Kagome is now left behind in the Modern Era while her friends live on in the Feudal Era. Depression begins to set in. Nothing matters anymore. Her family is at their worst end. This forces Mrs. Higurashi to call the one person she never thought she'd have to speak to again. Kagome' s half sister. Lover's Spat - Inuyasha has done it again but this time instead of 'sitting' him to take out her frustrations she goes off and finds the one person the despises Inuyasha worse that she does. Spring has come and with it the Inu heat. Inuyasha has never thought Kagome looked so good, but he's not the only one. A certain Daiyoukai suddenly finds the Miko of the hanyou more interesting than ever. What's a girl to do with all this attention? Written for The Christmas Challenge in the Banner Challenges through Dokuga_Contest section. It's Christmas time and Kagome wants to share the joys of Christmas with her friends; this perks the interest of a certain Daiyoukai. Now as husband and wife; Sesshomaru and Kagome make their journey as mates. Now forever bound they will have challenges thrown their way; however the biggest challenge either will face will be keeping the two most powerful Inu clan united as Kagome makes plans to ensure that youkai make it to the Modern Era. However, with possible war on the horizon how can one Miko and a proud Daiyoukai accomplish the impossible? Thank you for reviewing Life After Loss again! In Sesshoumaru's point of view, Kagome is just stepping up to the role she's already been given. And he is proud to see her finally become the Lady he knew she could be. Feedback from M-Angel 05: Aw. He's become such a good mate for her. I can't wait to see what else is in store for our duo. Glad you enjoyed the update! ^^ And there's no need to fear I'd forget this story, I've been updating it regularly for the past two years, with one chapter out every two months! Love your work's of art and that's what they are pure art in the forum of words. I hope you continue with you story's as they are something I look forward to seeing. Feedback from M-Angel 05: Thank-you. I'm really trying to find a way to keep updating this story more than once or twice a month, but I have four other stories I'm doing on AO3 and fanfiction.net that I'm doing too. If you like Akatsuki no Yona (Yona of the Dawn) I have stories on those sites too. I am currently writing Chapter 80, so hopefully it will be posted by December 4 (Sunday). Thank you so much for your review on Inevitability! I'm happy to be back writing for fun; I've missed writing this story! Thanks for reading and reviewing on my Her Inevitable Destiny! I'm glad you like it! I will update soon again, so stay tune! Feedback from M-Angel 05: I'm anxiously await the next installment. I just love your story! Feedback from M-Angel 05: You're welcome. I really enjoyed your story. This is a bit late, but thanks so much for your review for Kindred Spirits! I'm glad you like the story so far, and it makes me happy to know that you like my writing! Keeping a balance between dialogue and general text/descriptions is an interesting challenge. I hope you look forward to future updates, and I hope they continue to meet your expectations! Have a nice day! Sesshomaru is across town with Kagome, it was sort of a flash back and then Inuyasha knew he would be listening in on the phone confer station. I'm sorry that was a bit confusing, I was testing a new style of writing. Feedback from M-Angel 05: Ah! Ok. You could use italics for flashbacks, but I enjoyed the chapter. Feedback from M-Angel 05: I bet! I'm kinda sad about Inuyasha becoming such a jerk so quickly. Thanks for your review for Blind Love. I hope you enjoy the rest of the story as it's posted! Feedback from M-Angel 05: It's a very unique story. I like how it's going so far.